If you were into riding back in 2000 please have a look at this thread and let me know if you have any information. Sorry if we are not allowed to do this. If not, please lock/delete thread. Thanks! Riding in 2000 is old school? I was riding in 1982. You know, when the movies E.T. and Tron came out. yeah I remember TNT's. nice, nothing special, endemic of the aeronautics crash and resulting CNC backyard builder era. If they're mint they're worth whatever a collector wants for them, under 200$ for sure, under 100 makes more sense to me. you mentioned they're low-pros... double check the bcd, make sure they're not 110's. might have a set of compact roadie cranks instead! I meant no disrespect to anyone. I would say that this particular pair of cranks is from probably the mid 90's actually as I know I got them just before I want to Panama and that was in 95'. 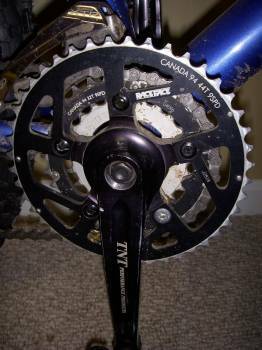 I put Race Face Rings on them a while back and when I mean low profile, I mean that the portion of the crank where it connects with the BB actually is slimmed down a bit, it is much smoother and doesn't have the knuckle looking machine work like the ones in the picture. I was going to go shoot some pics of them just now but it looks like the camera is in the wifes truck at swim practice. Will try a little later. just thought that something dated THIS decade being labelled as "old school" was kinda funny. Agreed... but then I picked the mountain biking habit up in '85... back when you didn't have to say "rigid" because every bike was... and the mere thought of step-in pedals made people shiver... and "disc brakes" were called by another name -- "rims"... and Suntour was as big a brand name in components as Shimano... and neon colors where hip (especially neon pink & neon green)... and nobody weighed their off-road bike because it simply never occurred to them to do so... etc., etc., etc. These be the good ol' days, folks. ^^I hear you, I was riding road bikes back then so the thought of even going off road mean I was either taking a leak or just crashed! Hey, my current bike now has lime green grips and cables. May not match but I just felt led to do it. Pics of it up on my Christmas came early thread now. Also posted pics of my TNT's, hell, here is a pic of them so you don't have to go look for the other TNT thread. Hey, my current bike now has lime green grips and cables. Wait long enough and everything comes back into style. I would agree! I will probably swap the cables back out to black over the winter but just felt the need to be a little different. I'm hoping you are using "style" loosely. Sometimes it is best to keep the past buried. Perturbing that you were riding when I was learning to walk. Senior Speed forum is turning into the Geriatric Ward before my very eyes. You should do the Creampuff dressed like Bon Jovi. For the memories. d00d, whatever. I thought of you while on a moto tour Sat./Sun. Rode to the Oakridge Brewer's Union, where I enjoyed a reuben at a sidewalk patio table. From there took Larison Rock Road west to Sharps Creek, then south over Canton Creek to the North Umpqua to camp with Sasquatch and a couple others who'd mountain biked the upper half of the NUT that day. Lounged Sunday morning until ~11am, whereupon I rode to Diamond Lake (refueled), then enjoyed a half-pound burger at the Prospect Cafe in beautiful downtown Prospect, Oregon. Proceeded to Lake of the Woods, Crater Lake, then back down the North Umpqua to Canton Creek and more backroads, devoid of traffic into Cottage Grove and eventually home. Dust that SV off and let's hit it. I'll show you Senior Speed, ya whippersnapper. Señor Senior-Speed, I told you before, I prefer "young punk"